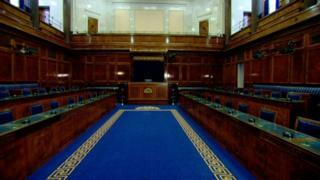 MLAs disillusioned with the political deadlock are preparing for life away from Stormont, the BBC has learnt. One unionist politician was interviewed for a job in Scotland this week. A nationalist MLA is considering a return to a career in law, in case devolved government does not return. The Assembly collapsed in January but its members are still on full pay. The NI secretary ordered a review of MLAs' salaries last month. James Brokenshire has received advice on MLA's pay from Trevor Reaney, a former Northern Ireland Assembly chief executive. As well as the issue of how much MLAs should be paid in the absence of devolved government, Mr Reaney has been assessing their staff, office and travel expenses. Mr Brokenshire is expected to make the contents of the pay review public next Wednesday. Daniel McCrossan, from the SDLP, said his legal career may sit alongside his duties as an MLA for West Tyrone. "I always have a Plan B and in this scenario it is no different," he said. "It is very important that I protect not only the interests of the public and duty I have as an elected representative, but also to protect my private interests as well to ensure I am able to meet those financial obligations at the end of every month." "I am no different from any other man or woman out there who works every day of the week," added Mr McCrossan. He also supports any move by the secretary of the state to reduce MLAs' pay. Former Alliance leader David Ford said action should have been taken on MLAs' pay long before now. "We are not doing the full job and so we should be on two thirds pay, which is what happened during previous suspensions" he said. "The secretary of state shouldn't be consulting now, he should have acted but most of all he should be acting to get the assembly working so we can deal with the problems that really matter to people" Mr Ford added. The secretary of state is expected to publish the report on pay next week but is not expected to take action on it until the new year. Meanwhile, it has emerged Mr Brokenshire spoke with party leaders by phone on Thursday to explore ways to reopen negotiations on restoring devolution.